Givenchy Eau de Moiselle is a beautiful, delicate and enchanting perfume that embraces the Grace of Rebellion. Givenchy presents Eau de Moiselle de Givenchy, a floral eau de toilette interpreted in a vintage spirit and infused with the brand’s emblematic aristocratic values. Between tradition and modernity, Eau de Moiselle de Givenchy is for a young woman of subtle sensuality and an affirmed personality.The composition centers on rose which is the main ingredient of the perfume which was rendered as an imaginary flower bathed in morning dew. Givenchy Eau de Moiselle begins with fresh mandarin, italian winter lemon,and japanese basil, over subtle floral oriental tones of turkish rose, ylang ylang, orange blossom and a beautifully soft and lasting base of cedar wood, ambrette seed, tonka bean, crystalline musks. 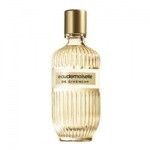 Between tradition and modernity, Givenchy eaudemoiselle Eau De Toilette is for a young woman of subtle sensuality and an affirmed personality. Inspired by the south of France, Eau de Givenchy captures the smoothness of orange blossoms disclosed by the zesty citrus orchards and only subverted by comforting musks.